The Speaker of the Lagos State House of Assembly, Adeyemi Ikuforiji, on Saturday condemned Thursday’s violent protest at the Lagos State University, LASU. Mr. Ikuforiji said steps would be taken to avoid a recurrence. Mr. Ikuforij spoke at the school premises when he led some other members of the house on a visit to the institution to assess the level of damage done during the protest. He said that the house, after its investigations into the crisis in the school, would come up with recommendations. The university had been shut on Thursday just as examinations were about to begin after a violent students’ protest which led to destruction of property in the institution. Some students of the institution protested following the closure of the portal for registration when they had not registered. He said that the damage done to the administrative block of the school was scary and it was the grace of God that saved the school’s Vice-Chancellor, John Obafunwa when the students attacked the building. 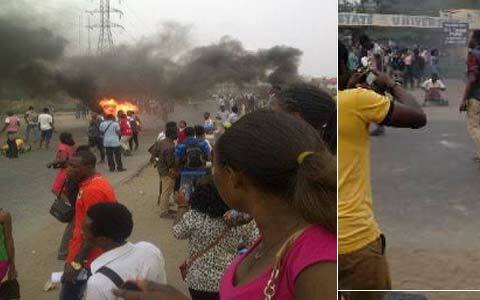 “We are close to seeing the end of crisis in LASU. “The last few years have been better than the previous decades; there has been tremendous improvement in LASU. “If the right thing is done, we will get scandalous events behind us in LASU,” the speaker said. The lawmaker said that the assembly would ensure that necessary repairs were carried out in the school. He condemned the damage done to the office of the vice-chancellor and the destruction of vital academic documents during the protest. The speaker, however, said that efforts would be made to re-open the school soon. Mr. Ikuforiji said that the issue of hostel accommodation for the students would also be considered. “The purpose of not having hostels in the campus has been defeated. “We have told the vice-chancellor to consider Private Public Partnership (PPP) arrangement for the hostels. ‘’We are sure hoodlums aggravated the violence; with hostel accommodation, the students would have been curtailed and it would have been difficult for the hoodlums to infiltrate them,” he said. The vice-chancellor and other management staff led the speaker and other lawmakers round the areas affected by the incident. Many of the lawmakers were dumbfounded on seeing the extent of damage done to property during the protest. The legislators had on Friday summoned the school management, led by the vice-chancellor, and the Students Union Government of the school, led by Mojirade Hassan, over the issue. The legislators, after listening to both sides, had condemned the students’ action and pleaded with the school’s management to open the portal for two days to give those who were yet to register a last chance. Mr. Ikuforiji, who read the resolution, warned that such an issue would not be entertained next time and promised to raise a panel of inquiry on the matter.